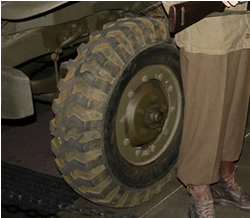 The style and dimensions of the tires used on American military vehicles have been controversial for years, especially with regard to scale modeling. I remember articles in the old AFV-G2 magazine of the 1970's on which tires were used for what, and today there are repeated discussions regarding the accuracy of the tires used on kits such as the Tamiya M8 armored car, AFV Club 155mm gun, and DML 105mm howitzer. Fortunately definitive data exists in the holdings of the US Army Military History Institute at Carlisle Barracks, PA; the National Archives at College Park MD; in modern military and government specifications, and on surviving vehicles. 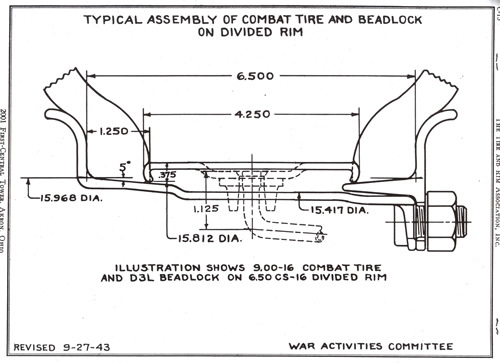 It is possible to create a reasonably complete picture of tire configurations used during World War II from this data. There were four common tread styles in use on tactical vehicle tires: Highway, Directional, Mud and Snow, and Military Desert. Only one had any relevance as to how the tire was constructed. A 9.00-20 Highway tread, Combat tire, mounted on a divided wheel with a 6.00 CT-20 rim profile. Highway tread, also known as HW, civilian, or truck and bus, was the tread commonly seen on civilian trucks, with sharp shoulders and a crowned and grooved tread surface. Developed for good wear and traction on paved surfaces, it could easily clog with mud in cross-country travel and become essentially a smooth balloon tire. It was used primarily for rear area vehicles and unpowered axles (trailers and towed weapons) but was regularly substituted for other treads during the War because of shortages. Directional tread was a descendent of agricultural or tractor tires with chevron lugs. It was commonly seen on half-tracks and scout cars early in war. This tread was recommended to be the "maximum traction" tread style January 1942 (OCM 17704) but the non-directional Mud and Snow tread was adopted instead in March (OCM 17926), and the directional tread was rarely seen after that. The biggest problem with this tread style was that the tires became "handed" and could only be used on one side of the vehicle. a crowned tread and sharp shoulders. The cross-section of a Military Desert tire showing the wider, rounded shape. Mud and Snow, also known as MS or NDMS, was the standard tactical tread for the Army (OCM 17926). It provided good traction with its straight, alternating lugs and was not required to rotate in a particular direction, unlike a directional tread. Its cross-section was similar to the Highway tread, with a crowned tread and sharp shoulders. Military Desert, also known as MD, was the tread style developed specifically for desert and amphibian applications where good traction in soft terrain was required (OCM 19547). It appeared similar to the Mud and Snow tread but was notable for having rounded shoulders. Unlike the other treads, MD tires had a specific construction that was more flexible than the other types. Tire construction was of three types: Standard, Combat, and Military Desert. 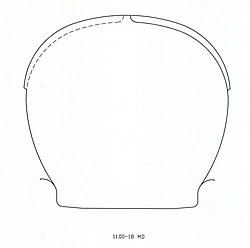 The first two were designed to maintain the tire's shape (to varying degrees) when deflated while the MD construction was intended to flatten considerably and distribute the carried load over a larger area. Only the MD construction implied a specific tread type. Standard and Combat construction could be used with various tread styles. Standard construction used a combination of bias wrapped cords and sheet rubber layers with a molded-on tread. This was the normal peacetime method with a balance between economy (using less material) and durability (using more). When deflated or under inflated, these tires would flatten and bulge the sidewalls. Running them in this condition would quickly destroy the sidewalls and ruin the tire. 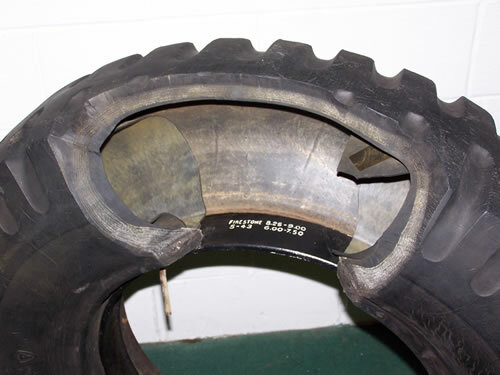 Here is a sectionalized Combat MS tread tire showing the extremely heavy construction, the dark black beadlock, and the inner tube on left. Combat construction was adopted as standard in October 1941 (OCM 17285). They were developed as "run-flat" tires that would allow continued operation for 75 miles (eventually reduced to 40 miles) even after being punctured by bullets or shell fire (OCM 19747). These tires used significantly more rubber (50-60%) in their sidewalls to maintain rigidity, along with beadlocks, a metal band that went inside the tire and pressed the beads outward against the rim, which added to sidewall rigidity. (The beadlocks also prevented slipping on the rim.) Because of the rigid construction and beadlocks normal one-piece wheels where the tire was stretched over and between the flanges could not be used. A two-piece divided rim was concurrently developed that effectively split the wheel in two (much like most model kit wheels) and was assembled from either side of the tire. While it was possible to change a tire without removing the wheel from the vehicle using a divided rim this practice was apparently little used. Divided rims could also be used with standard tires. An illustration of the combat rim. The removable part of the rim is to the right and faced outwards when the wheel was mounted on the hub. The beadlock in the center wedged the tire beads against the rim flanges to prevent slippage when air pressure was lost. 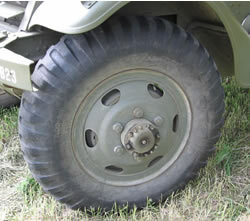 Military Desert tires were similar to Combat types in that they used a divided rim and locked the tire to the wheel, but instead of maintaining their shape while deflated they were designed to flatten in a controlled manner and remain durable when running under-inflated. 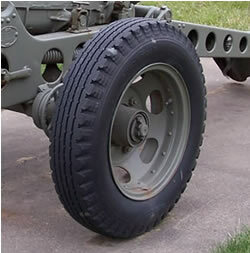 It should be noted that the vehicle tires of today are typically of radial ply construction, not the bias ply of WW II. Thus, while even properly modern inflated tires will have bulged sidewalls, in WW II there should be no noticeable sidewall bulging. Both radial and bias ply tires will have a small flat spot in contact with the ground, however. The only notable thing about tire sizes is that the numbers do not provide a means of determining the outside diameter of the tire. For example, a 9.00-20 tire is not 2 x (9.00) + 20 = 38 inches in diameter. (40.1 to 40.7 inches are the actual limits.) 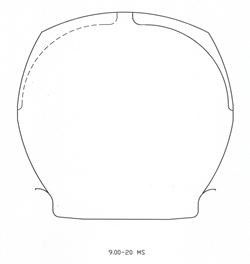 The first number (9.00) is the nominal section width, not height, so unless the tire cross-section was square or circular the height will be different. The second number is the nominal rim size, representing the inside diameter of the tire or the outside diameter of the rim between the flanges. Unfortunately this is not something you can measure once the tire is mounted on the wheel. In June 1943, AA gun carriages were changed to standard construction highway tread tires but retained their divided rims (OCM 20890). 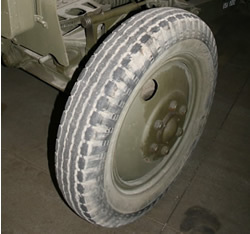 OCM 25163 from September 1944 authorized the substitution of standard construction tires on the M10 ammunition trailer. Additionally, the M1 120mm AA gun mount went from 13.00-24 HW to 14.00-24 MS. In December 1944, standard construction MS tires were allowed as substitutes for Combat MS tires on the M21 ammunition trailer (OCM 26037). 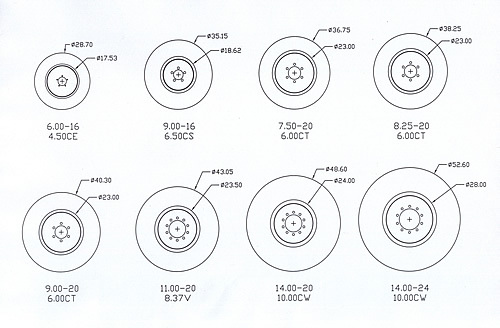 Finally, in late December 1944, OCM 26109 allowed the substitution of HW tread tires for MS tread tires as needed, but preference for MS tires was to be given to motor vehicles. Surprisingly, there was little standardization of sizes among the various vehicles used by a particular type of unit. For example, prime movers and the trailers or weapons they towed frequently had different tire sizes! The table below lists the tire sizes and constructions used for the more common WW II vehicles. Construction (and to a lesser extent wheel type) is indicated by S, C, or MD. Note: The M8 carriage used a different wheel (six lug nuts) than the others (five lug nuts). NDMS and MD data was taken from a post-war military specification and may differ slightly from the wartime values. 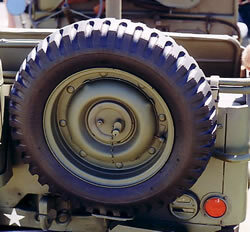 A 9.00-20 MS tread tire on an M3A1 scout car. The wheel is the "lock ring" type intended for use with standard construction tires and are not authentic to this vehicle - they should be 8.25-20. 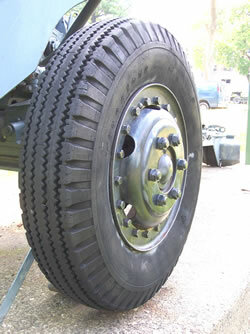 While the tire size was different both the 8.25 and 9.00 used the same wheel, whether standard or combat. A Life Magazine photo of an M3A1 scout car with two styles of Directional tread tires. and gun only five. The howitzer wheels also had the wheel dish concave out, opposite typical installations. 7.50-24 HW wheels and tires on an M2 or M2A1 conversion 105mm howitzer carriage. These were replaced on new-built M2A1 and M2A2 carriages with 9.00-20 Combat tires with HW or MS treads. This spare is a 6.00-16 MS tire. The Combat capable separated wheel is unusual in that the nuts holding it together are on the inside and the riveted studs on the outside. 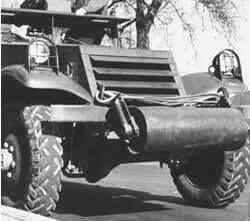 A WC-54 Dodge 4x4 ambulance mounting 9.00-16 tires on divided combat wheels. This may not be an American tread pattern. TB ORD 139, Air Pressures for Tires on Artillery Carriages, 10 August 1944. The Tire and Rim Association, 1942 Year Book Military Supplement, November 1943. 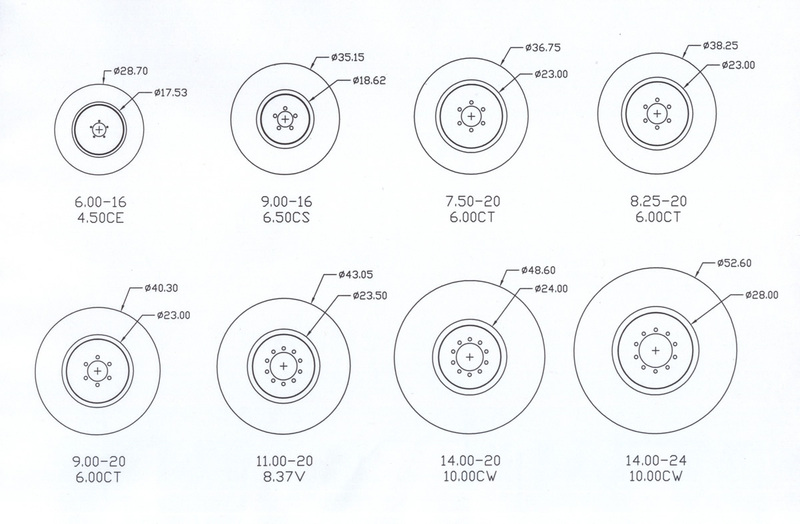 MIL-T-12459; Tire, Pneumatic: For Military Ground Vehicles.